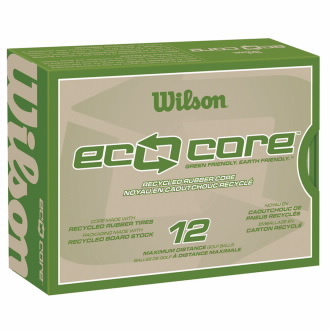 The Wilson® Eco Core Golf ball is a bit better than your standard ball, for the environment anyway, and it is a good try to bring a bit of green to the greens. Basically the Wilson® Eco Core Golf balls have a core molded from unvulcanized automobile tires. They are packaged in recycled paper, and save about 40% of the materials, and energy to produce a ‘normal’ golf ball. The rubber from recycled tires replaces the virgin polybutadiene used in most all other golf balls. For players, the internet says these balls are “lower-spinning distance ball”, but I confess I don’t know what that means. For our industry, the imprinting goes on the ball itself, with pad print of 7/8″ diameter around the middle of the ball, or as a top of ball print, also at 7/8″. The imprint can have a max of 5 colors, with 4 color imprint being standard. The recycled paper box is the standard retail looking packaging. It is not imprinted. But it does explain the pedigree of the golf balls inside, so that helps to get the sustainable story across to your audience. So these are golf balls, which means golf events at their #1 promotional use. If your event, or course, is working on its environmental footprint, using these balls as the event give-away can add a nice touch. If you are interested in the Wilson® Eco Core Golf ball to promote your own business, email info@proformagreen.com for information and pricing.